Scenario: I tried upgrading my router and it seems that the upgrade process has failed. 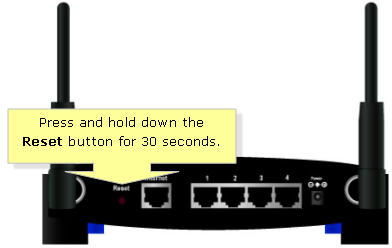 I can’t ping the router and I’m unable to open the web-based setup page. I also noticed that the Power light of the router is blinking. What should I do? Solution: If you encounter a firmware update failure with your Linksys router, you can use the Management Mode to recover the router and resume the loading of the firmware upgrade. In the Management Mode, the router will have just enough functionality to load your downloaded firmware. You should be able to recover the router in most situations. NOTE: You can download the firmware for your router model by directly connecting your computer to the modem to gain Internet access. Make sure that you download the correct firmware for the specific device and version to prevent technical problems that may damage the router. For instructions on how to download firmware from the Linksys Support Site, click here. Press and hold down the Reset button for about 30 seconds. While still holding down the Reset button, unplug the router’s power cord. Leave it unplugged for at least five (5) seconds and then plug it back in. After 5 seconds, you can let go of the Reset button. Access the router’s web-based setup page. To know how, click here. If you are using a Mac® computer, click here for instructions. Once the web-based setup page opens, you should be able to see the Management Mode Firmware Upgrade page. Click on the button and select the firmware file from your local folder then click the button. You can now follow the on-screen instructions to complete the firmware update. QUICK TIP: If you accidentally encountered Management Mode, you can exit by simply unplugging the power cord from the router and plugging it back in. NOTE: If you’re still encountering difficulties in upgrading your router’s firmware or you are unable to enter Management Mode, you may visit the Linksys Support Site for additional information.